We love having friends over for themed playdates. While I do have very creative and crafty mommy friends, our mommy brains get fried from time to time. I generally turn to other bloggers for fantastic resources and craft ideas. But today, I have the opportunity to share a website that might help you come up with some fun play on your next playdate! You know, just in case your brain is feeling a little fried too. 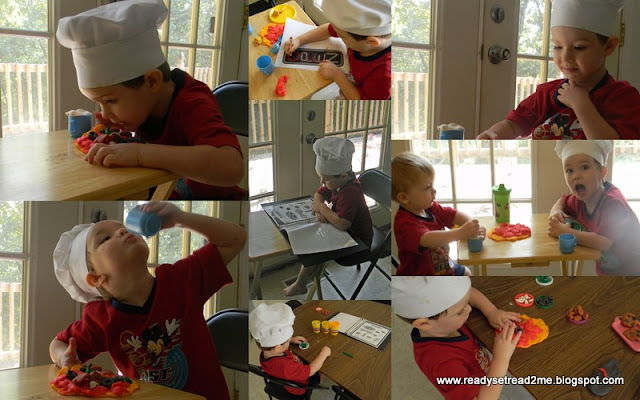 We were given the opportunity to review the site, PLAY-DOH Playdates, a free resource from the PLAY-DOH company. The website provides several themes to chose from such as spring picnic, back to school, icecream shop, pizza shop, and more. We decided to try out September's theme of pizza shop. Each theme includes step-by-step instructions to create PLAY-DOH fresh Ideas, printable crafts, and healthy snacks to help you host the perfect PLAY-DOH Play-Date! 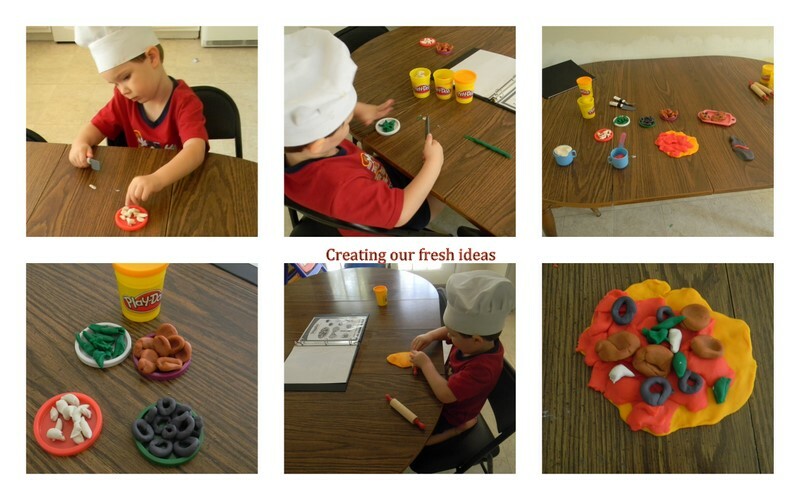 The Fresh ideas section gives step by step instructions for making these fun pizza shop goodies. 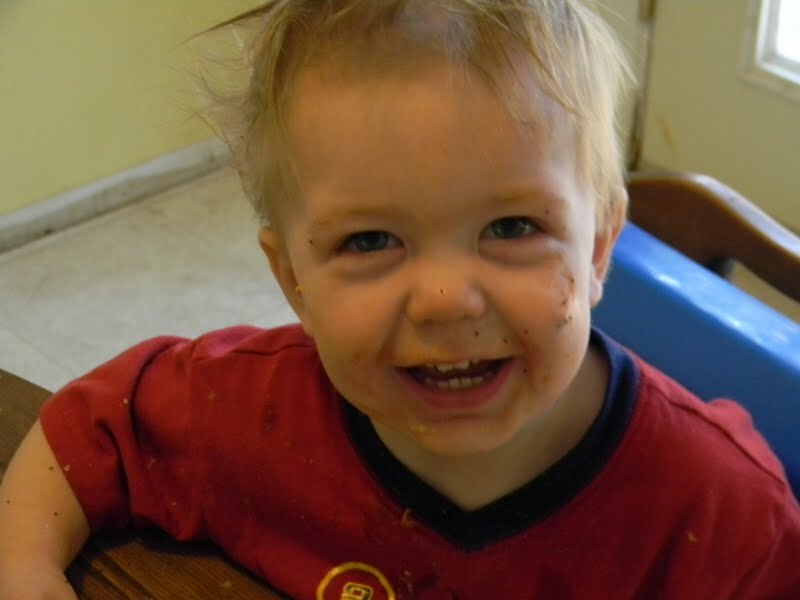 Logan was soooo excited that he could put olives on his pizza. The boy is seriously addicted to olives. I printed the crafts ahead of time. The crafts weren't anything my boys could make themselves (they are 3 and 1 1/2). But they loved the pizza box I made for them. And they loved the menu. The menu was actually my favorite part of the entire playdate. I love incorporating writing into play. I just slipped the menu into sheet protector pages and gave the boys dry erase markers for taking orders. This allowed us to do the activity over and over and over.. .For little ones like this, scribbling next to the chosen food item is a great way to practice "writing". Using the menu also communicates the idea that text (and pictures) carry meaning! For our snack, we chose the English Muffin Pizza. There is a step by step recipe included. Not only can your child make his own pizza, but the instructions are easy enough that even a preschooler can follow along with the picture. This was another great way to incorporate reading for a purpose. Although... I'm not sure I can recommend make your own pizza night for a 1 year old. It was definitely followed up with BATHTIME! While there is a lot of literacy involved in the play, I think it would be cool if PLAY-DOH had recommended books that matched the theme of the playdates. One that we read to accompany our pizza parlor play was The Little Red Hen Makes a Pizza by Philemon Sturges. This is a cute retelling of the traditional little red hen with a twist on the ending! We will definitely try out more of these fun playdates. In fact, I've already planned our next choice. I want to try out the Back to School Playdate because my oldest son will LOVE filling in this world map with playdough. How CUTE!!! Looks like they had GREAT fun making all those "delicious" pizzas! :-) I especially love that you had menus.... great idea!